Rotary Drum Seed Cleaner is a Universal machine and designed as multi task machine which can do Pre-Cleaning, Fine Cleaning and Grading of seed lot such as barley, wheat, corn, oat, rice, soybeans, sunflower, canola, beans, chickpeas, lentil, yellow pea and all granule seed types. Seed Cleaning; Rotary Drum Cleaner consists of an aspiration system followed by a rotary perforated drum screens. 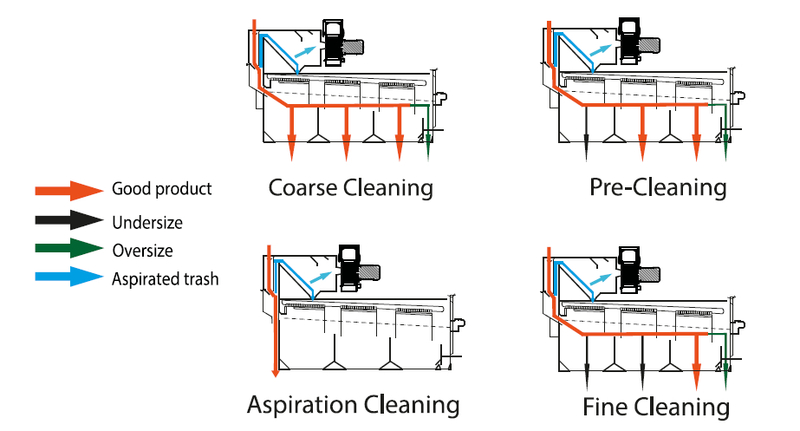 Seed passes through aspiration system to separate light impurities, then screening task occurs on designated perforated screens as required operation and undersize admixtures separated and oversize admixtures separated at the end of the drum. Seed Grading; Rotary Drum Cleaner consists of an aspiration system or it can be supplied without aspiration system if not required for Seed Grading purpose. 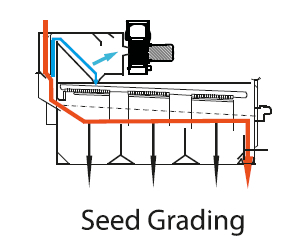 Seed passes through aspiration system to separate light impurities (if aspiration system supplied) then screening task occurs on designated perforated screens as required operation and undersize sizes/grades separated in the drum.